In his new book “Suicide of a Superpower: Will America Survive to 2025?” MSNBC contributor Pat Buchanan argues that “ethnonationalism” is tearing the United States apart and that the “European and Christian core of our country is shrinking.” In his dire introduction, he warns that the “nation is disintegrating, ethnically, culturally, morally, politically.” And he strikes the same themes during his TV and radio appearances promoting the book. In response, African-American civil rights organization ColorOfChange.org and CREDO Action gathered 275,000 people who are demanding that MSNBC President Phil Griffin fire Buchanan immediately. 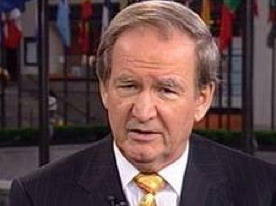 Buchanan has not appeared on MSNBC since he began promoting his book on Oct. 22.